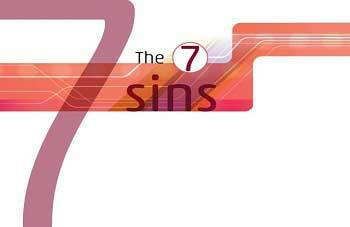 Seven Sins of Customer | Business Article | MBA Skool-Study.Learn.Share. Consumer and customer rule the brain of the marketing department, the salesman, the CEO and every person in the company who has the responsibility to understand them. Every company is looking forward to build the knowledge of what consumers want and what they will need in future. For years, we have been able to explore the brains of consumers and customers by either asking them questions, by asking experts, by consulting, by understanding the trends, by sometime building our own assumptions and by becoming a consumer or customer ourselves. Many have tried to dig the deep parts of human emotions and still many are trying to get the slightest hint of what consumers are looking for and what customer will chose among the given options. To tap the right emotion at right time can define the success of a company’s product. The person who gave seven deadly sins to the world truly chalked out the other side of human emotions apart from those of only happy or sad. Be it a product or a service, a company can attract customers by understanding these seven sins ,which in today’s world are becoming key source to increase the number of buyers. I may be the biggest contributor to the online sales, because every now and then I keep on buying stuffs from online markets. I also persuade others to buy it online. A simple reason persuades me to do so, the greed of discounts and benefits of referral bonus. My mind is just tempted at the very idea of discount. This is one strategy which all the e-commerce businesses have understood well and this is one strategy which will aid those who provide big discounts. As long as you are ready to give discount, people are ready to buy from you. For example a mobile worth 13000 being sold at original price at one site will have fewer sales than the mobile discounted to 10%off on other site. The e-commerce industry is growing for the reason that it can offer the same product at discounted rate and the customers are happy to get it at cheaper price. The offers like free gifts spoil the customer in a way that they expect it from every website and they may continue searching for sites where they can get discounts or free gifts along with the product. However this greed cannot be diminished easily as long as the competition is offering the benefits of buying products from their site. Can the site answer the question of ‘why should I buy from you when other site is providing the same product at lower price or with extra benefits’? Customers greed is visible and valid and this is one area company’s can focus in order to increase their sales. Lust is desire and the advertisements are the biggest culprit in enticing the young generation to the lustful buying behavior. Be it the advertisement of Britannia bourbon or skore condoms, the idea of attracting young generation by tapping their lusty side is here to stay. Companies understand the way the new generation is feasting on the idea of pure pleasure of owning a product or buying a product which will make them feel in heaven. Apple has targeted the segment of people in a way so as to create that desire to hold an i-phone. You can always get a dream girl by buying a hair gel. Here the desire is created by simply understanding the lustful side of human being. Creating such desires seems to be a great strategy to increase the sales. These are the customers who don’t care about the brand or they are too lazy to research before buying. These are also those who are most loyal to the company as they are too lazy to switch the product. Switching from one brand to another brand will require research. Research requires analyzing and reading through various experts’ advice. The sloth customer would not make it a point to do such hard work. Companies can be assured that if they have such customers then they will never go out of business. Then there are those who switch frequently because it does not matter to them which brand product they are buying, they just want the product.There are those who don’t take steps to understand why they are buying a product of that brand and part of them are those who lack knowledge of anything of such sort. They are too lazy to acquire knowledge or keep track of what other brands can offer. Such customers who switch frequently may be difficult to understand as they would not be loyal to any brand. However to attract such customers the idea of discount and free gifts offer may work well. May be a free massage! One bad moment of truth requires 10 good moments of truth for customers to be satisfied with your product or service. The last thing a company would want is to see the wrath side of the customer. A good service and a good product increase the chances of customer to stay with you. But at any time a customer feels cheated or his expectations from the brand are not fulfilled it becomes difficult to face his anger or to even comfort him. When a person calls to a company reporting about the bad product or poor service, he expects the query to be resolved and right compensation to be given to him. If such expectation is not fulfilled within a limited time, the anger may be unleashed and then starts the volley of abuses which indeed sums up his wrath. Companies must set an example of good service. Providing right training programs for their employees to improve service and manufacturing products of good quality are few things to avoid the customers turning into wrath-man. The pride of owning a tag heur watch and pride of owning a Rolls-Royce car are few examples where the company’s products are worth their value. Customers feel proud to own such brands. Proud in terms, that they have the ability to buy such products. Apple laptops are pride for their owners. They feel great to carry it around, open it in public, work on its beautiful keyboard, fall in love with its smooth working and finally to be able to tell it to anybody with joy that he owns it. The top class may be the one feeling proud to have a million dollar car but from the customer point of view even a poor man buying a parle-g packet of Rs 4 and feeling proud to have it, shows us that brand must not only cater to the satisfaction level of the customer but create loyalty in such a way that the customer feel proud to own the product. Every customer is important in this regard and if company understands this then it can get assure that its customers are proud of it. The advertisements once again are the main reason to enhance the jealousy level of the customers. A company’s advertisement shows that your neighbors are doing much better than you just because they are using their products. A sense of envy is built upon by introducing offers which will attract not only your neighbors but also you. How can you see your neighbor winning alone in a competition? Or how can you see your neighbor owning a luxury car when you don’t even a car? Envy works in a way so as to attract such people. The idea of competence and jealousy are matched well in order to attract customers indirectly. Coming up with new ideas of envious advertisement and tapping this feeling may increase your sales. Gluttony is also defined as excess of anything. The idea of buying in excess is to pull customers in buying more in order to derive benefits. The offer of buy 4 to get one extra free has caught the eye of all customers. The idea is to explore the gluttonous side of the customer. Even though they may or may not require it or they may not use it for long time the idea of ‘buy it now cause offer is now’ is fast catching up. It’s one of the sins which have been successful for bulk buyers from such shops. An offer of buy 8 shirts free with one shirt has attracted many customers. This idea is also here to stay as it matches with the greedy side of the customer. A glutton will try to buy it in excess and greed of owning that extra shirt makes him proud of striking a great deal. This article has been authored by Shubham Shukla from NMIMS Mumbai.